To date, oil-rich plants are the main source of biodiesel products. Because concerns have been voiced about the impact of oil-crop cultivation on the price of food commodities, the interest in oil plants not used for food production and amenable to cultivation on non-agricultural land has soared. As a non-food, drought-resistant and oil-rich crop, Jatropha curcas L. fulfils many of the requirements for biofuel production. We have generated 13,249 expressed sequence tags (ESTs) from developing and germinating Jatropha seeds. This strategy allowed us to detect most known genes related to lipid synthesis and degradation. We have also identified ESTs coding for proteins that may be involved in the toxicity of Jatropha seeds. Another unexpected finding is the high number of ESTs containing transposable element-related sequences in the developing seed library (800) when contrasted with those found in the germinating seed library (80). The sequences generated in this work represent a considerable increase in the number of sequences deposited in public databases. These results can be used to produce genetically improved varieties of Jatropha with increased oil yields, different oil compositions and better agronomic characteristics. The need to reduce greenhouse gas emissions and provide fuel security has increased the demand for oil-rich plants as raw materials for biodiesel production. Although vegetable oils have long been used for food, the ideal crop source for biodiesel products should consider other ecological, environmental and ethical concerns. Ideally, the entire process, from cultivation to fuel burning in engines, should favour carbon sequestration, reduce water needs and promote energy efficiency. Moreover, the impact of oil crops for biodiesel production on the prices of food commodities is a matter of concern. Ideally, such crops should be non-edible and grown on non-agricultural lands so that they do not compete for soil with food crops and do not affect the price of food commodities. Jatropha curcas L. (family Euphorbiaceae) is a perennial, drought-resistant and non-food oilseed crop that has high oil content and fulfils many of the requirements for biodiesel production. Jatropha is currently one the most promoted oilseed crops and its seeds have an oil content of up to 50% . Its major fatty acids are oleic acid (34.3-45.8%; 18:1), linoleic acid (29.0-44.2%; 18:2), palmitic acid (14.1-15.3%; 16:0) and stearic acid (3.7-9.8%; 18:0) . Because Jatropha seeds accumulate very high levels of protein in the endosperm, the residue obtained after oil extraction may potentially be used for animal feed, adding extra value to the crop. Despite the recent attention that Jatropha has received as an oil source for biodiesel products, its potential has not yet been fully realised. Unlike other oil crops such as soybean, maize, rapeseed and sunflower, there are no agronomically improved varieties of Jatropha . Potential areas of improvement are increased oil yield and reduced seed toxicity. Genomic and transcriptomic resources have been generated to accelerate the genetic improvement of many crops . Although a privately held company announced the completion of the J. curcas genome, the data have not been made publicly available, and transcript resources in public databases are scarce. 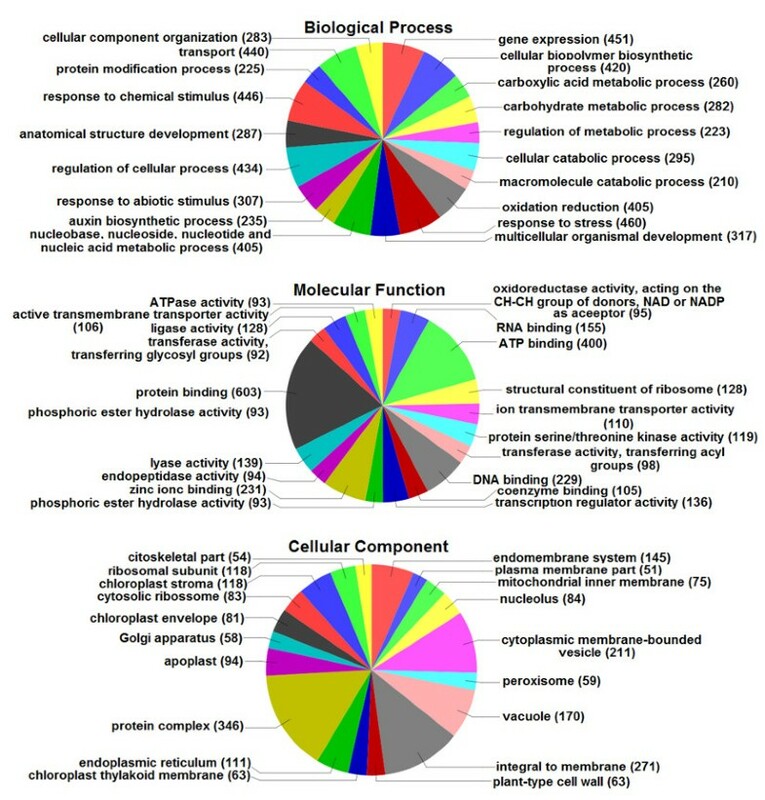 To bridge this gap, we have sampled the transcriptome of developing and germinating Jatropha seeds to unveil the gene repertoires of J. curcas related to the following: (1) oil accumulation during seed development and oil breakdown during germination; and (2) proteins possessing toxic, anti-nutritional or allergenic properties and enzymes involved in the biosynthetic pathway for phorbol esters, the major toxic components of Jatropha seeds. Here, we have sequenced 13,249 ESTs from two cDNA libraries of J. curcas developing (JD) and germinating (JG) seeds. Sequencing of transcripts from these two contrasting developmental phases has allowed us to assess differential expression and discover most genes that are related to lipid metabolism. We have used these sequences to reconstruct the main metabolic pathways related to lipid synthesis and breakdown in J. curcas. The sequences presented in this work represent a considerable increase in the total number of J. curcas ESTs deposited in GenBank. These results will be useful for further biotechnological interventions related to Jatropha seeds. We have generated cDNA libraries from pools of developing (19, 26, 33 and 40 days after pollination - DAP) and germinating endosperm (24, 36, 48 and 72 hours after imbibition - HAI) of Jatropha curcas seeds. We have sequenced 7,320 ESTs from the developing pool (JD) and 5,929 from the germinating pool (JG), totalling 13,249 high-quality ESTs. The lengths of the ESTs after trimming ranged from 100 to 848 bp, with an average size of 561.5 bp. The ESTs from both libraries were assembled together into 1,606 contigs and 5,677 singletons, resulting in 7,283 unisequences. All unisequences were aligned against the non-redundant (NR) protein database of GenBank using BLASTX with an e-value cut-off of 1e-10. We found matches for 4,928 unisequences (67.7%). The remaining 2,363 unisequences with no matches in the NR database were subjected to gene prediction analysis using ESTScan. This approach resulted in ORF predictions for 1,766 unisequences. The combination of the NR matches with the ESTScan predictions resulted in 6,694 (91.9%) putative protein-coding unisequences, of which 161 contain a complete ORF (full-length sequences). Blast2GO  categorization was performed, as shown in Figure 1 (See additional file 1 for automatic annotation of all unisequences using Blast2GO). It is noteworthy to highlight the oxidoreductase activity and auxin biosynthesis in this annotation, both of which are key processes in early plantlet establishment related to energy uptake from seed reserves and growth, respectively. Important signal transduction elements were categorized such as putative serine/threonine protein kinases (119 unisequences) and transcription factors (89 unisequences). Several predicted cellular components have been identified as membrane-associated proteins. Functional Classification. Functional classification of Jatropha unisequences obtained from developing and germinating seed libraries. The detailed bioinformatic protocol is shown in Figure 2. All ESTs were deposited in the dbEST division of GenBank under accession numbers GT969394 to GT982642 (See additional file 2 for the correspondence between internal unisequence IDs and GenBank accession numbers). Bioinformatics pipeline for EST clustering, assembly and annotation. We generated 16,112 reads (9,214 from JD and 6,998 from JG). All reads were trimmed and 13,249 reads were kept for clustering. The clustering resulted in 7,283 valid clusters that were aligned against the GenBank non-redundant protein database (NR), the Arabidopsis thaliana predicted proteome (At) and the Ricinus communis predicted proteome (Rc). Because our cDNA libraries are not normalised, we were able to use the EST abundance in the resulting contigs to estimate differential expression levels of transcripts in each cDNA pool. Among the top 20 most highly expressed transcripts in JD, there are three different transcripts coding for storage proteins belonging to the 11 S globulin family (Table 1; Contig153, Contig81 and Contig818) and one transcript coding for an aspartyl protease (Table 1; Contig254), which is known to be involved in processing the precursors of storage proteins into mature proteins . These findings are consistent with the high levels of storage proteins in the endosperm of J. curcas seeds . Reflecting the intense catabolic activity within germinating seeds related to the mobilisation of protein reserves , three of the most abundant transcripts code for proteinases of the cysteine proteinase family (Table 2; Contig1184, Contig515 and Contig1058), which are known to be involved in protein mobilisation during seed germination . Another abundant transcript codes for a cysteine proteinase inhibitor (Table 2; Contig724), which is thought to be involved in spatial and temporal control of storage protein mobilisation by cysteine proteinases during seed germination . Transcripts related to breakdown of the oil and carbohydrate reserves, such as acetyl-CoA C-acyltransferase, are also represented amongst the most abundant transcripts in the germinating library (Table 2; Contig1038). Subunit 8 of the mitochondrial F(O) ATP synthase complex. The annotation revealed surprising differences between the number of transposable element (TE) sequences in the JD and JG libraries, both in terms of the number of unisequences containing a TE-related sequence (475 unisequences in JD and 42 unisequences in JG) and in terms of their relative expression levels (800 ESTs in JD and 80 ESTs in JG). Suppression of transposon silencing in the endosperm during seed development has been described in Arabidopsis . This suppression was concluded to result from genome-wide demethylation of maternal alleles in the endosperm. Arabidopsis uses this mechanism to imprint expression of maternal alleles in the endosperm. In that work, the authors suggest that temporally regulated transposon activation carries a moderately low cost to Arabidopsis because it has few functional transposons and the endosperm genome is not transmitted to the next generation. Unlike Arabidopsis, Jatropha has many active transposons, as evidenced in our JD library (800 ESTs). Further investigation will be necessary to verify if the high number of TE elements in JD is related to demethylation of the maternal alleles during development. The seeds of J. curcas are extremely toxic to a wide range of animals, but the biochemical basis for this toxicity is still under investigation . Curcin, a class I ribosome-inactivating protein (RIP), is present in J. curcas seeds but its toxicity is at least 1000-fold lower than that of ricin, a class II RIP from Ricinus communis . In our libraries we were unable to find transcripts coding for curcin homologues, but a preliminary proteomic analysis of developing and germinating seeds led us to identify five curcin isoforms (data not shown). Several transcripts coding for protein inhibitors of serine (SEI, Table 3) and cysteine (CPI, Table 3) proteinases were found in both libraries. Although the presence of these protein inhibitors may raise biosafety concerns regarding use in animal feed, it is unlikely that they play a major role in toxicity because their effects are relatively mild (King et al., 2009). Uniquences assigned to enzymes related to toxicity in seeds. The columns JD and JG shows the number of ESTs for each unisequence in developing and germinating endosperm, respectively. The p-value refers to the Audic-Claverie statistics for differential expression. NJD shows the number of ESTs in JD normalised to 10,000 reads. NJG shows the number of ESTs in JG normalised to 10,000 reads. The seeds of several Euphorbiaceae are known to be a rich source of powerful allergens of the 2 S albumin family, rendering the cultivation, handling and consumption of seeds a serious health hazard. Transcripts coding for 2 S albumins were found only in the JD library, which is consistent with the role of these methionine- and cysteine-rich storage proteins as a specialised reserve of sulphur for the growing seedling . Although the issue of allergenicity in connection with J. curcas seeds has not yet been raised, the presence of 2 S albumins in seeds may become an important health issue given the interest in the use of seedcake, which is the byproduct remaining after seeds are used as biodiesel source, as animal feed. Therefore, the allergenicity of protein fractions from the seeds and other tissues merits investigation. Another important toxic component of the J. curcas seeds is a group of diterpene esters termed phorbol esters, which have structures based on a tetracyclic carbon skeleton known as tigliane (Haas et al., 2002). Phorbol esters are thought to be the major toxic components of seeds. These compounds mimic the action of diacylglycerol (DAG), an activator of protein kinase C, which in turn regulates different signal transduction pathways and other cellular metabolic activities and thereby amplifying the efficacy of carcinogens (Goel et al., 2007). We have searched our libraries for transcripts that could increase our understanding of the phorbol ester biosynthesis pathway, and found several transcripts coding for enzymes involved in synthesis of the major subclasses of terpenoids. The terpenoids are synthesised from the basic five-carbon unit isopentenyl diphosphate (IPP) and the initial prenyl (allylic) diphosphate, dimethylallyl diphosphate (DMAPP), which is formed by the isomerisation of IPP. Prenyltransferases catalyse alkylation of one or more molecules of IPP (C5) with DMAPP (C5) to produce geranyl diphosphate (GPP; C10), farnesyl diphosphate (FPP; C15) and geranyl geranyl diphosphate (GGPP; C20). Transcripts coding for farnesyl-diphosphate synthase (FPS2, Table 3) and geranylgeranyl-diphosphate synthase (GGR, Table 3) were found in our libraries. The identification of genes related to Jatropha toxic components can accelerate the development of genetic strategies to produce varieties of J. curcas with low toxicity, increasing the possibility of using the seed as animal feed and obtaining a plant with improved agricultural handling characteristics. We have used KAAS  and KOBAS  to annotate automatically Jatropha ESTs coding for orthologues to plant enzymes in the fatty acid biosynthesis, fatty acid degradation, triacylglycerol biosynthesis and triacylglycerol degradation pathways. ESTs related to plant lipid metabolism were also manually annotated using PlantCYC  and the Arabidopsis Lipid Database  (TBLASTN/BLASTX bidirectional best hit; e-value 1e-10). We have integrated and compiled these data to propose schematic metabolic pathways that lead to oil accumulation in Jatropha seeds. While most ESTs coding for fatty acid biosynthesis enzymes were found in JD, the fatty acid degradation pathway is enriched in JG ESTs, which is expected considering that these stages are dedicated to oil accumulation and breakdown, respectively. In the fatty acid biosynthesis pathway, we found a considerable number of ESTs coding for almost all enzymes (except KAS III and HAD, Figure 3). More specifically, we found ESTs coding for enzymes catalysing reactions that ultimately produce oleic and stearic (FatA, Table 4), linoleic (PCH, Table 4) and palmitic (FatA and FatB, Table 4) acids, the main constituents of Jatropha seed oil. Additionally, we found 12 ESTs coding for oleoyl-ACP desaturase (FAD2, Table 4), which catalyses the polyunsaturation of oleoyl-ACP (18:1) to linoleoyl-ACP (18:2). Because oleic and linoleic acids are the major constituents of Jatropha oil, this enzyme is a potential biotechnological target for modulation of Jatropha oil composition. Number of unisequences assigned to enzymes of metabolic pathways related to oil accumulation and breakdown in the seeds. NJD shows the number of ESTs in JD normalised to 10,000 reads. NJG shows the number of ESTs in JG normalised to 10,000 reads. See additional file 4 for the unisequence names and AC statistics. Fatty acid biosynthesis pathway. Jatropha enzymes found in the fatty acid biosynthesis pathway. The icons beside each enzyme name show the total number of Jatropha ESTs corresponding to that enzyme in JD and JG, separately. KAS I participates from the 2nd to the 6th carbon-chain extension cycles. KAS II participates in the 7th carbon-chain extension cycle. Both FatA and FatB can catalyse conversion of 18:0-ACP into stearic acid. The fatty acids produced by this pathway are 16:0 (palmitic acid), 18:0 (stearic acid), 18:1 (oleic acid) and 18:2 (linoleic acid). See additional file 4 for the unisequences assigned to each enzyme. Another important lipid class is the acylglycerols, which act as an energy reserve in many organisms and are the major components of seed storage oils. The most common acylglycerol in seed oils is triacylglycerol (TAG). Upon arrival in the cytoplasm, free FAs become esterified to coenzyme A (CoA) and serve as substrates for TAG synthesis from sn-glycerol-3-phosphate (see additional file 3: TAG_biosynthesis.jpg). After synthesis of 1,2-DAG, the formation of TAG can occur in two ways. In one pathway, diacylglycerol acyltransferase (DGAT, Table 4) transfers an acyl group from acyl-CoA to sn-3 of DAG to form TAG. We found one EST in JD and one EST in JG coding for DGAT. 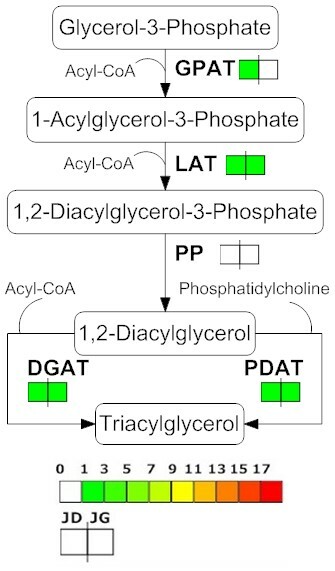 Another pathway involves a phospholipid:diacylglycerol acyltransferase (PDAT, Table 4) that utilises phospholipid as the acyl donor in TAG formation. The contribution of PDAT to the formation of TAGs in Jatropha oil is unknown, but its role in the castor bean has been identified as preferential incorporation of Δ-12-modified fatty acids. After biosynthesis, pools of TAG can be stored in the mature seed in the form of oil bodies surrounded by a single monolayer membrane that is most likely generated through budding of the outer ER membrane. The membrane contains proteins known as oleosins, which are thought to stabilise the oil body during desiccation of the seed . We found three ESTs coding for oleosins (OLE, Table 4) similar to the Arabidopsis oleosin AT4G25140.1. We have used the same method described above to propose pathways related to oil breakdown. During germination, the embryo uses TAGs accumulated during development as an energy source. To this end, TAGs must be metabolised to free fatty acids (Figure 4) and then to acetyl-CoA. Triacylglycerol degradation pathway. Jatropha enzymes found in the triacylglycerol degradation pathway. The icons beside each enzyme name show the total number of Jatropha ESTs corresponding to that enzyme in the JD and JG, separately. See additional file 4 for the unisequences assigned to each enzyme. Specialised lipases named TAG lipases appear to be induced during germination in most species . The function of these lipases is to hydrolyse TAG into fatty acids and the intermediate product: diacylglycerol or monoacylglycerol . As expected, we identified a large number of triacylglycerol lipases in our JG library (TL, Table 4). Free fatty acids are metabolised into acetyl-CoA in the endoplasmic reticulum. We have found ESTs coding for all enzymes in the fatty acid degradation pathway. We also found a large number of ESTs for an acetyl-CoA C-acyltransferase, which catalyses acyltransferases reactions (FADA, Table 4). Here we have sequenced and annotated a collection of ESTs from libraries of developing and germinating seeds of Jatropha curcas. We identified ESTs related to transposable elements, toxic components and oil accumulation and breakdown in Jatropha seeds. Jatropha curcas is a species with agricultural relevance due to its oil-rich seeds, which can be used for biodiesel fuel production to help the world meet its energy needs in times of shrinking fossil fuel deposits. Given this economic significance, Jatropha plants require agronomic improvement. To achieve this goal, genomic information pertaining to the genes expressed in developing and germinating seeds, such as that described in this paper, is likely to be used. The need for such information is especially true for genes that are putatively involved in oil synthesis, accumulation and breakdown and those related to seed toxicity. For example, Jatropha plants can be genetically engineered to produce transgenic plants with improved oil content and/or composition. Methods can be applied to engineer the entire oil synthesis pathway, to increase expression of enzymes responsible for the synthesis of the sought-after fatty acids--oleic and linoleic acids--and to decrease expression of enzymes responsible for the breakdown of such energy-rich compounds. Moreover, Jatropha plants can be genetically improved using traditional or modern plant improvement methods to create varieties with reduced expression of potentially toxic compounds such as curcins, 2 S albumins and the enzymes involved in phorbol ester biosynthesis. Jatropha curcas L. developing fruits were harvested at 19, 26, 33 and 40 days after pollination. Fruits were dissected and the seeds were decoated to collect the endosperm, comprising developmental stages I to IV. Jatropha quiescent seeds were washed with 70% ethanol, decoated and sterilised with 3% sodium hypochlorite solution and 0.001% Tween-20 for five minutes. After five washes in sterile deionised water, Jatropha seeds were imbibed and germination was carried out in a 15-cm Petri dish on moistened filter paper at 28°C under constant darkness. We collected the endosperm at 24, 36, 48 and 72 hours after imbibitions (HAI), comprising germination stages I to IV, respectively. Total RNA was extracted using the CONCERT Plant RNA Purification Reagent (Invitrogen) from the developing endosperms at 19, 26, 33 and 40 days after pollination (DAP) and from the germinating endosperms at 24, 36, 48 and 72 hours after imbibition (HAI). RNA samples from the developing and germinating endosperms were mixed in an equimolar concentration into two pools, respectively. The two cDNA libraries were constructed using the CloneMiner cDNA Library kit (Invitrogen) following the manufacturer's instructions. The EST library was sequenced using the BigDye terminator v 3.1 kit and an automated DNA capillary sequencer (ABI PRISM 3700 DNA Analyzer - Applied Biosystems). All ESTs were 5'-sequenced using the M13F primer (5'-TGTAAAACGACGGCCAGT-3'). We used the Phred base caller software to extract sequence and quality files from chromatograms. Next we used the Baudet et al. EST cleaning pipeline to pre-process ESTs and prepare them for assembly. This pipeline accounts for plasmid similarity, polyA/polyT regions, low base quality and slippage. After identifying the positions of all of those features, it extracts the largest clean region of each EST. Sequences lacking a 100 bp clean region were discarded. We then used CAP3  to cluster and assemble the clean sequences into contigs and singlets (unigenes). For this step, we set the parameters to require an identity of at least 95% over 50 bp to detect pairwise similarities. After clustering and assembly, we used BLAST to search for similarities between our unigenes and sequences deposited in public databases. We used the predicted complete proteome of the model eudicot Arabidopsis thaliana (TAIR 8.0; www.arabidopsis.org) and the closely related Euphorbiaceae Ricinus communis (TIGR; http://castorbean.jcvi.org/), as well as the non-redundant protein (NR) and nucleotide (NT) databases of GenBank ftp://ftp.ncbi.nlm.nih.gov/blast/db for those BLAST searches. To search for putative coding sequences and generate conceptual translations, we ran ESTScan with a pre-built model for A. thaliana that is distributed with the package. 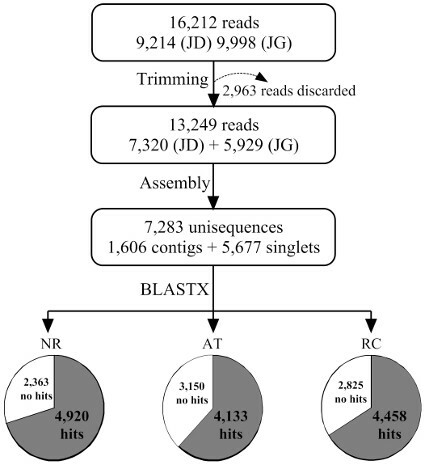 We also performed a Blast2GO analysis  to provide automatic annotation for unigenes using Gene Ontology terms according to BLASTX hits against GenBank NR database with a e-value threshold of 1e-10. To compare the expression of unisequences in developing and germinating seeds, the number of ESTs in each library was normalized by 10,000 reads. AC statistics  were used to estimate the significance of the differential expression. 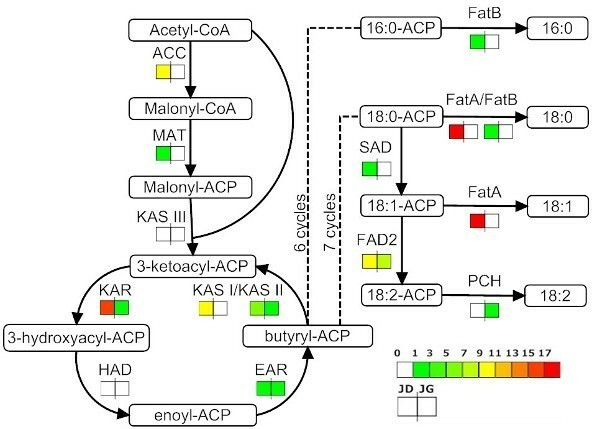 KAAS  and KOBAS  were used to annotate automatically Jatropha ESTs coding for orthologues to plant enzymes in the fatty acid biosynthesis, fatty acid degradation, triacylglycerol biosynthesis and triacylglycerol degradation pathways. The automatic annotations were enriched with searches for Jatropha orthologues to plant lipid metabolism enzymes annotated by PlantCYC  and the Arabidopsis Lipid Database  (TBLASTN/BLASTX bidirectional best hit; e-value 1e-5). All automatic annotations were visually inspected and edited as necessary. Gustavo GL Costa, Kiara C Cardoso, Luiz EV Del Bem contributed equally to this work. We thank the technicians and researchers who contributed to this work, especially Daniela Stancato. We also thank Professor Gilberto B. Domont for critical reading of the figures and for providing advice. This research was supported by the State University of Campinas (UNICAMP), the Northeast Development Bank (BND), the Brazilian Petroleum S/A (PETROBRAS) and the National Petroleum Agency (ANP). This research was supported by Petrobras SA, a Brazilian multinational energy company. The authors take complete responsibility for the integrity of the data and the analysis. GGLC performed the bioinformatics analyses, prepared the figures and drafted the final manuscript. KCC annotated the sequences and helped draft the manuscript. LEVDB prepared the first version of the manuscript, annotated the sequences and helped analyse the data. ACL annotated the sequences and helped draft the manuscript. MASC and FAC carried out the analyses related to the toxic components of the seed and helped draft the manuscript. LCL helped prepare the first version of the manuscript. FP critically revised and helped draft the manuscript. JAY and RV contributed to the bioinformatics analysis. RCM contributed to the metabolic pathway analyses. MJS conceived the study and carried out all of the experiments. All authors revised and approved the final manuscript.